Balloon-carrying payloads include PongSats, MiniCubes, and advertisements – as well as wedding rings. In September 2012, over 1,000 PongSats are to be toted by balloons high above Earth in a mission by California-based JP Aerospace. 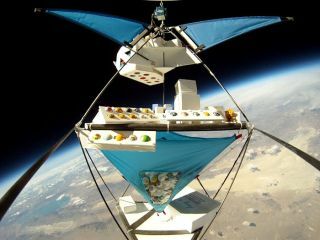 Cut-in-half ping pong balls are providing access to space for student experiments. JP Aerospace balloons toted armchairs, including this one, to the edge of space in 2009 for Toshiba’s “Space Chair Project” commercial. Back in 2009, JP Aerospace balloons carried armchairs to the edge of space for Toshiba’s “Space Chair Project” commercial ― documented by onboard, cutting-edge HD cameras. They showed the chairs adrift above the planet.